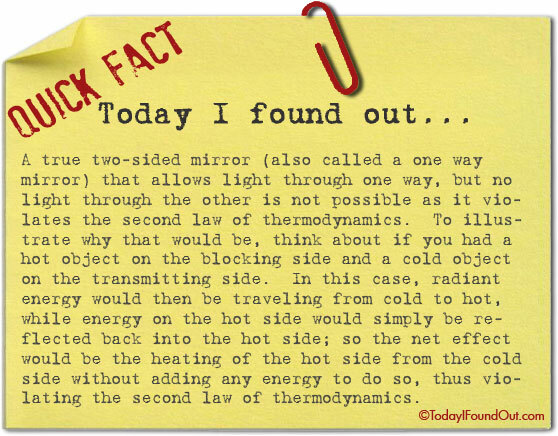 A true two-sided mirror (also called a one way mirror) that allows light through one way, but no light through the other is not possible as it violates the second law of thermodynamics. To illustrate why that would be, think about if you had a hot object on the blocking side and a cold object on the transmitting side. In this case, radiant energy would then be traveling from cold to hot, while energy on the hot side would simply be reflected back into the hot side; so the net effect would be the heating of the hot side from the cold side without adding any energy to do so, thus violating the second law of thermodynamics. @Joel: No they don’t; at least, not in the way most people think. It’s all about light levels. Turn on the lights all the way on both sides, and you can see right through.